Peter Hinssen’s most recently published book is entitled 'The Network always wins'. This publication is thus ‘a survival guide for anyone who wants to control the future.’ The book describes in detail how that future, to an even greater extent than we are currently used to, will turn out to be changeable, uncertain, complex and ambiguous. In the introduction, Peter Hinssen explains how he sees the essence of the current change: “We are experiencing a revolution in how society works. Many people, myself included, initially thought that this was due to digital technology. [...] We were wrong. Digital technology is not the cause. The networks are. What is happening right in front of our eyes is that everything is linked to everything else. Information flows more strongly through networks and that completely changes everything. Markets disappear, become information networks and the consumer is at the heart of this process. And if the outside world becomes a network, companies will have to follow suit. That’s the clue. No more, no less. If you understand networks, you’ll understand the future." Companies wanting to flourish in such an intangible future will have to stay fast and flexible or fluid. That’s not easy. The older and bigger they become, the more the inherent focus inevitably strands on the structure of companies, rather than on their intrinsic dynamics. The engine behind those dynamics is what Hinssen calls the 'inner innovation network' of an organisation. That cannot be identified from formal organograms. On the contrary. "It is the core which can move to the other side of the street to launch a competitor to your company. It is the group which can find the new idea to improve your company – and it is the group which you would prefer to keep out of the hands of your competitors. But most companies no longer know who is in their core innovation network. It’s a sort of secret club which is hidden in the dungeons of the corporate hierarchy." These are all forms of networks, cooperation between start-ups, parent companies, clients and other partners. What role do IP rights play in this approach to open innovation? "That’s a very difficult issue. You see branches of innovation, for example mobile telecommunications, where IP is very important and where big companies can build up huge portfolios of IP rights, just to defend themselves. On the other hand, you see new players who say that it’s about speed and market share. If they develop something revolutionary, particularly in the field of software where IP is always very difficult, for these players it’s a question of 'winner takes all'. Look at Airbnb, Netflix or Uber: who are the numbers 2 and 3 in those markets? I wouldn’t know. Such players have no time to get involved in IP. They don’t safeguard their position with IP rights, but just by wanting to be undefeatable. Google is a good example. Google earns 70 billion dollars a year with its search engine, and the algorithm behind it is in the public domain. In principle, everyone should be able to implement it. Google’s best kept secret is how they organise their infrastructure and their data centres so that they can operate on a hyperscale. Look at WhatsApp, the most used messaging app in the world. It has no protection; it’s about scale. That’s how the new players reason." With the emergence of these new players, do you also foresee disruption in the world of IP? "You can question the complexity which we’ve built in around IP. Look at the incredible difficulties and delays you sometimes come across to get something done. There’s huge potential here to rediscover that technologically. Think about the blockchain concept which offers a totally new way to organise trust, agreements and contracts, not via an independent third party, but in a peer-to-peer network. When we talk about a blockchain, many people think about bitcoins or other virtual currencies, but it’s much broader. I recently spoke at the 125th anniversary of the Royal Federation of Belgian Lawyers. We go to a lawyer to make a will because we trust that he will execute the testament as agreed. But these days, I can also make a 'smart contract' which resides in a blockchain. Such a will consists totally of logics, code, software: IF 'Peter Hinssen deceased' THEN etc. And if the government puts a tick against 'Peter Hinssen deceased', then all the transactions required to execute the will will automatically be performed. Everyone was suddenly quiet in the room. But if you manage rights, agreements about who is the owner of what or who is entitled to what, the entire legal profession will have to start thinking. That means that organisations which are concerned with these issues not only have to be legal experts, but technology experts too, data scientists, blockchain specialists." Do you know any parties who are already addressing this in the world of IP? "Companies like Ascribe and Blockai let artists and other creative people register the copyrights to their work and they monitor their online use. For example, if my photo is downloaded and used in a presentation, the blockchain is triggered and copyrights are automatically granted and financial transactions settled. So you see, it already exists! If you’re smart and you’re involved with IP, I’d take a good look at these new forms. They could turn out to be very disruptive at some point. The IP world will have to arm itself and reinvent itself. Take the enormous intellectual effort required to search in the multiplicity of patents or to determine whether there is a case of breach. Then imagine that algorithms will soon be better at doing that, and you’ll realise that it will be possible to replace a whole group of patent attorneys with very good algorithms." 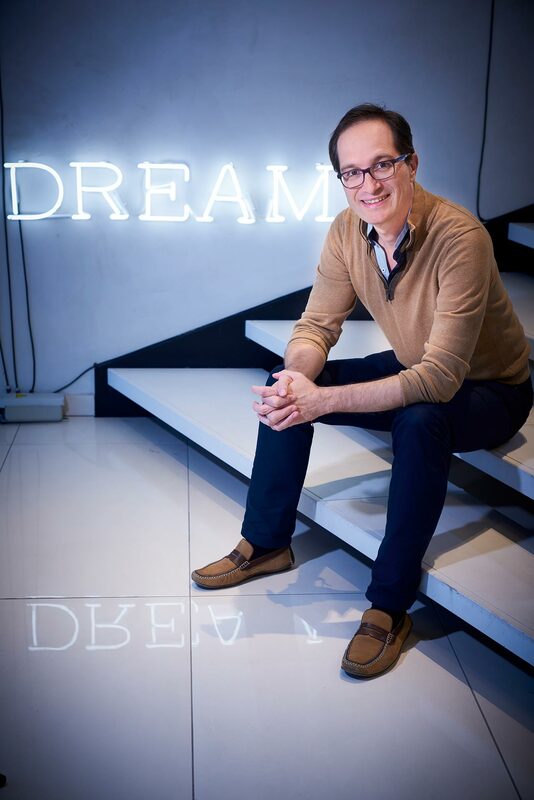 Peter Hinssen (1969) is an entrepreneur, advisor, speaker and opinion leader in the field of technology, digitisation and radical innovations and their consequences for organisations, leadership and society as a whole. He is the founder of five companies, the latest being nexxworks. Peter Hinssen teaches at the London Business School, the MIT Sloan School of Management and the Paul Merage School of Business at UC Irvine. His publications include 'The new normal' (2010) and 'The network always wins' (2014) and he is currently working on his new book 'The Day after Tomorrow'. Every year, Peter gives around 125 lectures at big, open events like MIT Startup Exchange and for Gartner, as well as at smaller, closed events, for corporate personnel or management, for example. His presentation 'The Tiger & The Rock' for TEDxBrussels was viewed over 31,000 times on YouTube. Peter Hinssen is a member of 'Digital Minds for Belgium', an initiative of the Belgian Minister for Digital Agenda, Alexander de Croo. Read articleRob Suters from IPStar about developing an artificial eco system and long-term manned space missions.